This book draws on the distinct phases of Jacques Lacan's career to show his way of thinking in and beyond his lifetime. It is an examination of the past, present, and futures of psychoanalysis, as these are developed in the dimensions of language, literature, logic, philosophy, visual culture, identity and sexuality, and politics. The interdisciplinary approach of the volume allows it to work across clinical, sociological, philosophical, and literary fields to both add dimensions to the literary/critical reception of Lacan and enable the system of Lacanian psychoanalysis to have a wider conversation. 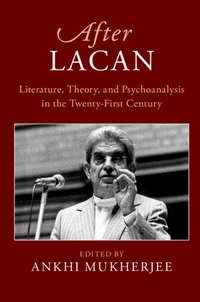 Re-examining the fundamental concepts of Lacanian theory in its historical contexts through the topological structures he inaugurated, After Lacan makes innovative critical interventions in contemporary debates on racism, Islam, the Communist Party, poetry, new media, disability identity, and queer theory. It is a key resource for students, graduates and instructors of literary theory, psychoanalysis, and the works of Lacan.